All the grand and great-grand children gather at my grandmother’s house. This hasn’t happened since, oh, so long ago that one of the kids wasn’t even born yet. Family math is complicated. I keep thinking our visit is like a tornado, though not like the burst pipe and busted hot water heater that recently tore through her house. After we eat, I wash plates and glasses and move on to pick potato chip crumbs out of her kitchen carpet (carpet! in a kitchen!) and she shuffles behind and tells me to stop, that it will give her something to do this week. She keeps old messages on her answering machine and I wonder if crumbs on the floor are like that. Like, at any minute the party might start again. These children are great, but it was my grandmother who filled the wheelbarrow. On the phone later, my grandmother tells me she has to go out and break down the pizza boxes we put out by the garbage or the truck won’t take them. I picture her tottering at the curb with a tiny pair of sewing scissors – the only ones I ever seem to​ be able to find – and consider hanging up and driving hours to do it for her. Tomorrow she will vacuum the kitchen, she says. Or maybe this weekend. It definitely won’t be tomorrow because tomorrow she has someone coming to look at a recliner chair she has been trying to give away. People hear free recliner and get excited, but I bet they don’t even know recliners were made back then. It’s even older than the console television set she’s hoping the recliner person also hauls away for her. I have a hard time imagining two burly men hoisting it above their shins. 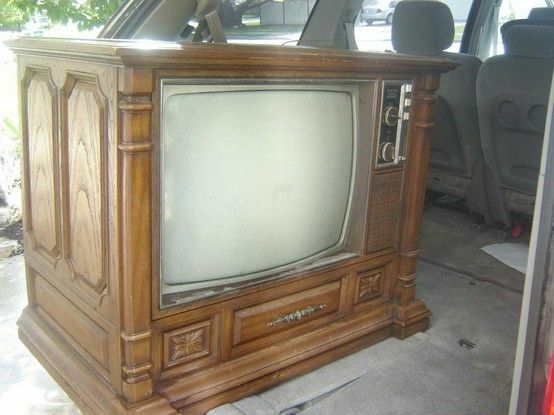 My grandmother tells me they bought the TV in the early 70s after my parents bought theirs and she had to have one. She said they went to Luskins but my grandfather balked at the price, so she said it was her money too, even if she didn’t have quite enough of it. 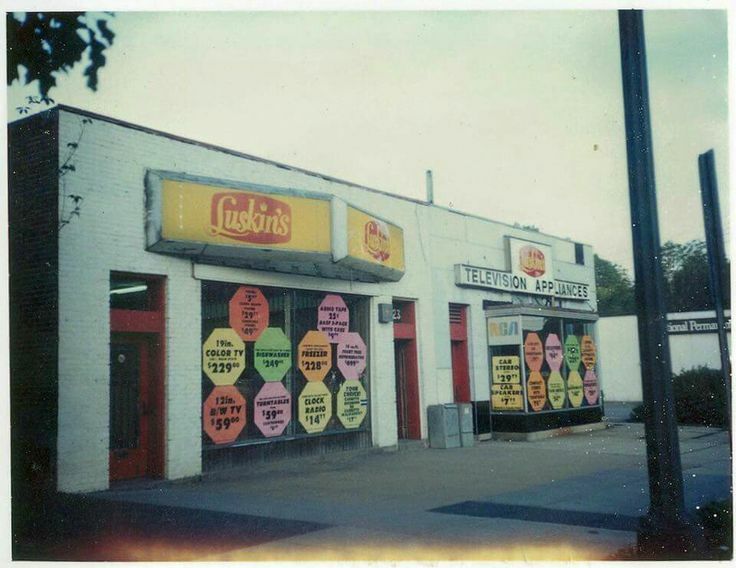 She said the fellas at Luskins didn’t give credit accounts to women back then, so she talked them into some kind of deal on paper and went home with her TV and stopped by with cash after work a few times. I have no idea how she got it home, but it’s only moved once since then and probably thought it was done. About ten years ago, it started taking longer for the picture to appear. You’d turn the set on and see black or purple, maybe a zig-zag of rainbow at the edge of the screen, and my grandmother would say you just wait a minute. You’d wait a few minutes and get bored and put the kettle on and when you’d come back, Dynasty would be on the screen on some channel that probably didn’t even exist. About five years ago, the picture stopped coming in at all, though the sound still worked. That poor old TV went blind and must have felt us scooting her across the room to a dim corner but thankfully never saw the wobbly Walmart flat screen that took her spot. Maybe the console set egged my 2 year-old nephew to pick up a cane and swing wildly in that direction. It’s possible. When we all leave my grandmother’s house, we leave at once. It’s always like that. We finish our last minute tasks – my brother puts in a storm window, I check her smoke detector batteries – and depart in a parade of waves and honks until she turns to a tiny speck in the rearview mirror and disappears. I feel guilty stopping at the reservoir a mile from her house, but the draw is stronger than guilt or desire to get home. The sun is setting and there are a handful of men fishing solo or in pairs. My girls and I walk a short path in the woods to get a better look and some pictures. When I talk to my grandmother on the phone two days later, I expect her to sound as exhausted as I still feel. Instead she sounds alert, invigorated. This, in fact, is when she tells me her plans to get rid of the bulky recliner and console and pizza boxes. I picture her hoisting them onto her back and dragging them into the distance until they turn to specks and disappear. Great piece. Your writing reminds me of a Wendell Berry book I am reading now – A Place in Time – I think you would enjoy it. Cool – placed a hold on it at the library (just like that). Thanks and hope you are well. The words, the photos, the goose bumps. You have no idea how much I love reading your words, Kristen. Especially when you write about your Grandma. Priceless! I’d say you sound like Garrison Keillor, but I don’t jump to the keyboard when I see a post from him in my inbox like I do yours. Sigh….what a great way to start my day. Love this piece. It makes me think about my grandmother. 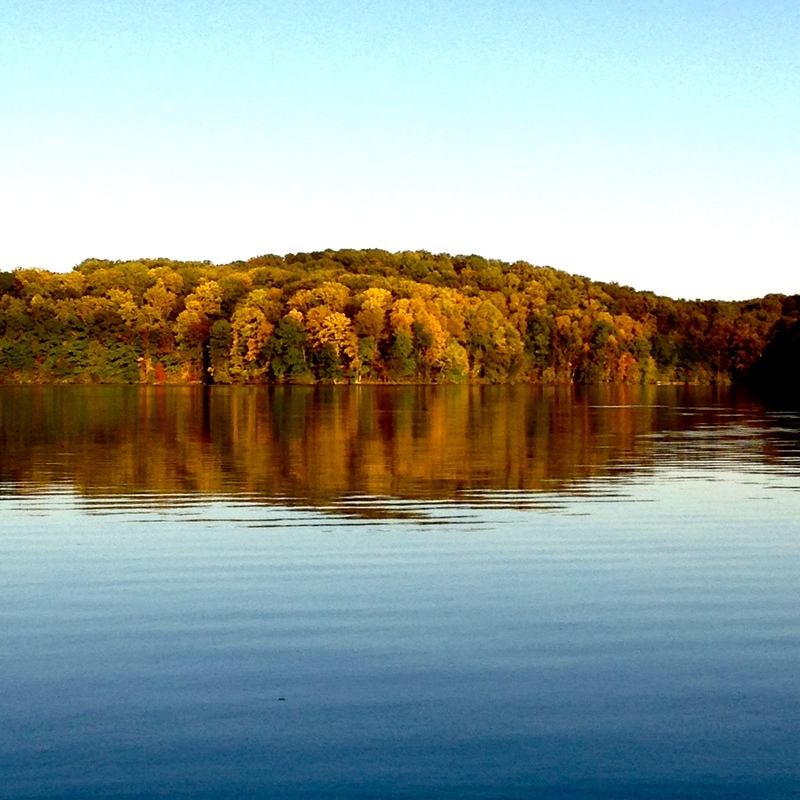 The photos taken at the reservoir feel perfect in tone for this particular post. Just beautiful! A wonderful portrait of Grandma, told well via the past possessions.